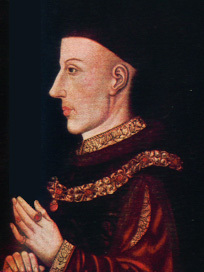 Eldest son of Henry IV. Born 1388. Crowned at Westminster, April 9th, 1413. "When Prince of Wales," says history, he "was committed to prison for affronting one of the King's judges." Elsewhere, we timidly refer to what a king's minister said of "History" - not to be repeated. Both stories may be equally false. Certain it is that history has truthfully related the great Victory of Agincourt, not to be discredited by dry-as-dust researches in rolls or records. That made King Henry V popular. He was but twenty-seven years of age (1415) when he won that great victory against overwhelming odds. "If God give us the victory," he said, "it will be plain that we owe it to His grace. If not, the fewer we are, the less loss to England." Did he who undoubtedly spake those words strike "in the very seat of judgment" the Lord Chief Justice, who was like "as a father to my youth," when he was crowned king? Hall, the chronicler, relates the incident. Shakespeare wrote Part II. of "Henry IV." (from which we quote) 1600-1, nearly two hundred years after the date (1412) when it is said to have taken place. Ten years later (1422) "the greatness of Henry V. had reached its highest point," and he reigned but nine years. "He had won the Church by his orthodoxy, the nobles by his warlike prowess, the whole people by his revival of the glories of Crecy and Poitiers." Whatever his moral delinquencies, they were forgotten and forgiven. He was almost worshipped by the people. The nobles were fascinated by his knightly qualities; the Commons generously aided him with supplies; the Church esteemed him for his piety and devotion to its interests. "A King and an Englishman" the recorded verdict; "the noblest representative of the House of Lancaster." He died at Bois de Vincennes near Paris at the age of thirty-four from dysentery contracted during the siege of Meaux. Catherine returned Henry's body to London where he was buried in Westminster Abbey on 7 November 1422. Whatsoever man might do for his country, that did Henry V as England's King. His abilities were no less conspicuous in the council than in the field.